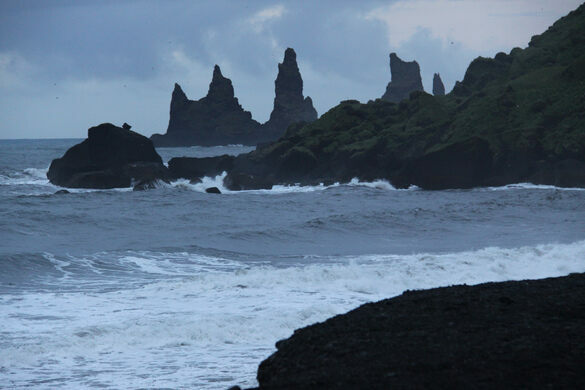 The Reynisdrangar from the cliffs above. 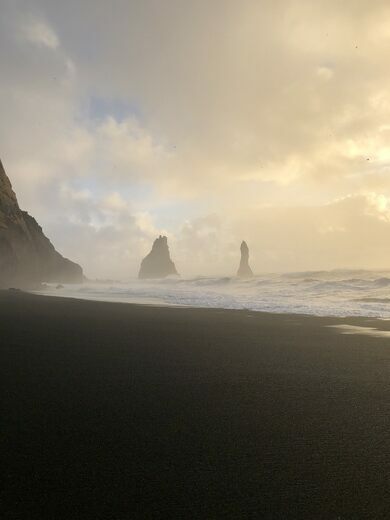 Just outside the tiny town of Vik, Iceland (pop. approx. 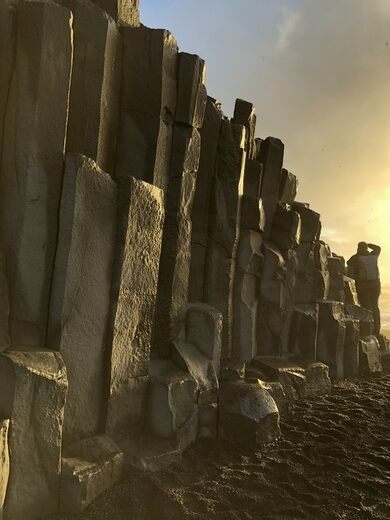 300) three black basalt columns called the Reynisdrangar protrude from the stormy North Atlantic. Legend has it that the rocks are three trolls, caught out too late and frozen by the early morning sunlight. 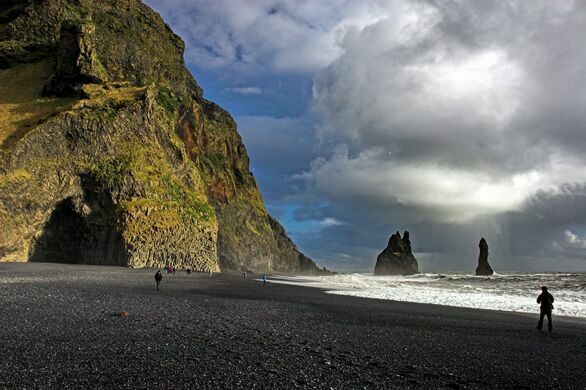 From the wild black beach at the foot of Vik, the towers can be seen off the misty coast to the west. 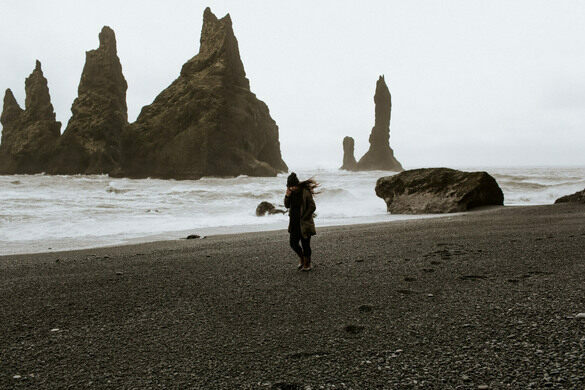 A better view can be obtained by shimmying along the cliffs towards the Reynisdrangar, although this is a risky proposition due to the risk of falling rocks, steep slopes and rough surf. For the best view, take the road up the hill to the west of the town. A series of switchbacks leads to the top of the plateau, and a ten minute walk to the west yields not only a view of a black sea arch in the distance, but an overhead view of the three trolls. 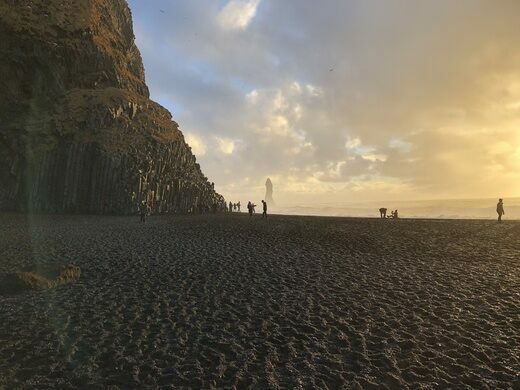 Let your legs dangle from the big cliff, and watch the gulls circle the Reynisdrangar as the surf crashes and sprays around the pillar’ base. 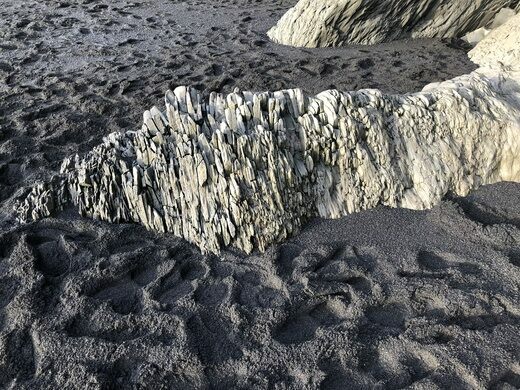 Once at Vik, the pillars can be seen from the black beach. Take the road up the hill to the west of town and, once on the plateau, head towards the ocean for a view from above.